TV and digital devices are certainly effective at keeping kids entertained. But how much is too much? Previously I've written about limiting screen time for older kids. Sadly pediatricians, psychologists and teachers are seeing babies and preschoolers with social, emotional and physical problems related to too much time on screens. Parents are getting the message that digital devices are great for babies and toddlers. You can now buy a baby bouncy chair and a potty chair with iPad mounts. You can buy apps that are designed just for babies and toddlers. One such app had this to say in its press release "Red Wagon Software announces the release of "Bonk! Bonk!" - its debut iPad and iPhone app for toddlers. Founded by Bill Brisky - a former Microsoft programmer - Inspiration for the endeavor started when Brisky's infant son Paul became enamored with his father's iPad and would delight in tapping images on the screen. Seeing his son's obvious joy, Brisky created "Bonk! Bonk!" - an interactive app where every time Paul would tap the screen a sound and colorful image would suddenly appear mesmerizing him for hours." Kids who are mesmerized for hours by an app are missing out on developing critical interpersonal skills. Setting screen time limits is essential for keeping your kids healthy. After presenting at the Crib to Classroom conference last weekend, teachers asked if I had a one page handout they could give parents on the problems caused by babies spending too much time with TV and digital devices. I didn't have a handout so I created one and it's featured in this month's newsletter. 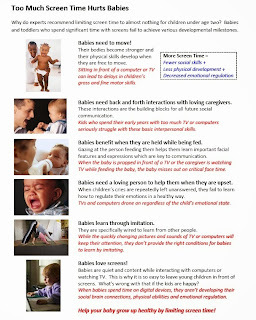 You are welcome to print and share copies of "Too Much Screen Time Hurts Babies".